Ripe red McIntosh apples on the tree. 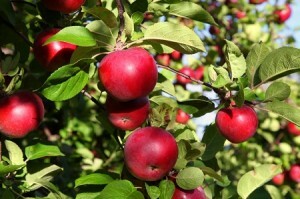 Tree fruit are an important component of the agricultural and homeowner landscape. Planting and management of apple and other tree fruit orchards is a rewarding hobby and business, but important considerations must be met to ensure success. This course trains beginning tree fruit growers in fundamental concepts in orchard planning and management. Content will include site selection and management, rootstock and cultivar selection, orchard systems, pest management, nutrient management, and harvest considerations for commercial orchards tailored to the northeast U.S.
ALL LEVELS – The course is for beginning tree fruit growers, or experienced growers seeking a refresher on basic concepts in orchard management. The topics covered will be specific to orchard systems. Anna Wallis, formerly Regional Fruit Specialist with Cornell Cooperative Extension’s Eastern NY Commercial Horticulture Program (CCE ENYCHP). Michael Basedow, Regional Fruit Specialist with Cornell Cooperative Extension’s Eastern NY Commercial Horticulture Program (CCE ENYCHP). Topics covered: Navigating moodle, course overview, evaluation of orchard goals, business planning, tree fruit botany. Topics covered: Site considerations for orchards, pre-planting site modification, orchard planning. Topics covered: Ripening physiology, harvest planning, crop load management, cold storage, marketing. Registration is closed. This course will next be offered in January 2020. Fee for this course is $250.